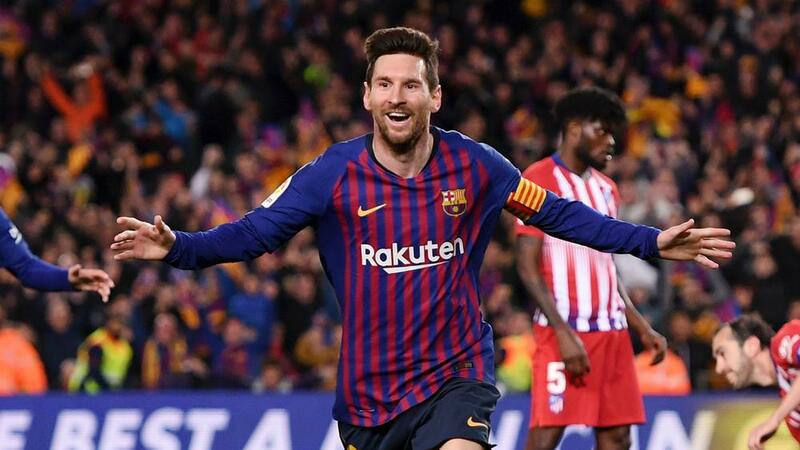 Luis Suarez and Lionel Messi scored late goals again to move Barcelona to within touching distance of the title, as it beat 10-man Atletico Madrid 2-0 at Camp Nou to open an 11-point lead at the top of LaLiga. Although Atletico — which had Diego Costa sent off in the first half — looked set to hang on to a draw, Barca's dominance ultimately paid off as Suarez and then Messi struck late in the day as they did against Villarreal in midweek to land what is surely a fatal blow in the race for the title. Barca edged a tense first half, which saw Costa given a straight red card in the 28th minute for berating referee Jesus Gil Manzano, although it was unable to turn its superiority into a lead, Jordi Alba coming closest with he hit the post after being found by Messi. Atletico weathered the storm for most of the second period as well, with Jan Oblak producing an inspired performance and several world-class saves, but he was finally beaten twice in the final five minutes as Suarez struck an unstoppable curling shot from the edge of the box and Messi danced and dazzled before securing a record-breaking 335th LaLiga victory.